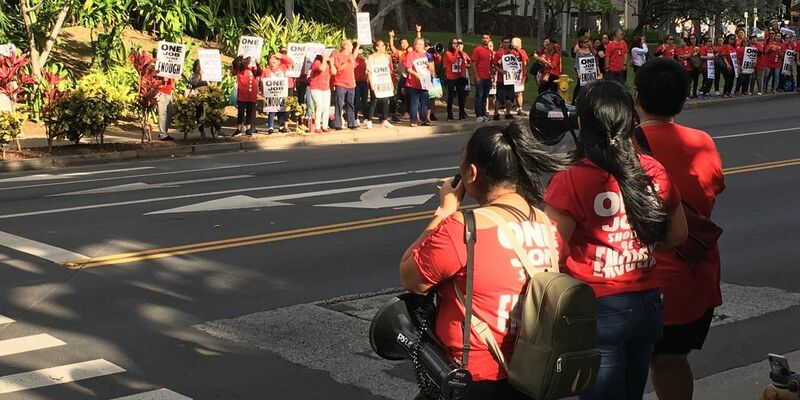 HONOLULU (HawaiiNewsNow) - In a possible sign of smooth contract negotiations to come, Local 5 decided Thursday not to hold a strike authorization vote before talks Friday with Hilton Hawaiian Village. “The employer has indicated a willingness to bargain seriously,” a union spokesman said Thursday morning. Local 5 represents about 1,800 direct employees of Hilton Hawaiian Village, the largest Hilton hotel in the world. A strike vote was still scheduled at Hawaii Care & Cleaning, whose roughly 200 Local 5 members do work subcontracted by Hilton. Strike authorization votes do not automatically trigger strikes, but authorize union leaders to call one later, without further votes, if circumstances seem to warrant a walkout. Last year, Local 5 did strike Marriott properties owned by Kyo-ya Corp., before reaching a contract with those hotels that is being used as a template for other Local 5 hotels here.